Here is another sticker to add to your sticker collection. Grab one of these free pink whale stickers from Vineyard Vines. 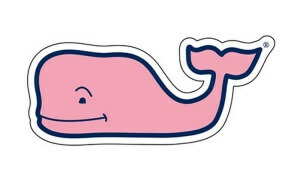 The pink whale is the signature item for the Vineyard Vines clothing line. This is similar to the alligator for Lacoste or the guy playing polo for Ralph Lauren. The pink whale is a bit cuter than either of those. If you like the pink whale then you should check out their clothes to see if they have the styles that you like. Vineyard Vines has all kinds of clothes including men’s, women’s and children’s clothing available. Grab one of these cool stickers while they are available.